Pensioners and employees of the state government have decided to launch a joint agitation against the non-payment of the Protected House Rent Allowance in three border districts of Punjab. A deputation of the progressive farmers from half a dozen villages, led by former SDM B.L. Sikka, met Vivek Sahai, general manager of the Northern Railway, during his recent visit here to apprise him about how the delay on the part of the Works Department in remodelling a siphon near the Pakki railway station had ruined fields and orchards at least in three villages. The EGS teachers, who have been sitting on a dharna for over a month, climbed a water tank near Gol Diggi here today and attempted at setting themselves on fire. The second-level test of the 11th National Science Olympiad and the 2nd International Maths Olympiad for Malwa region was held at the Kendriya Vidyalaya No 1, Bathinda Military Station, on Sunday. Nearly 400 students from 50 top schools of the region appeared in the tests. Neha Handa was adjudged the best folk singer among girls during the annual day celebrations of the Abohar Polytechnic College at the village Kala Tibba here late on Saturday evening. "Omission of former chief minister Captain Amarinder Singh's name from the state screening committee announced by the AICC is not a setback for the Captain,” said Raninder Singh, general secretary of the PPCC. "The educational institutions should also organise seminars to bring awareness among the politicians, who have earned a bad name by maneuvering for berths and perks for their wards while discarding merit in all the fields,” said Sunil Jakhar. Former chairman, Market Committee, Jalalabad, Gurbir Singh Sandhu, who had been actively associated with the Congress for more than three decades and had deserted the party to join SAD (B) two years back, today resigned from the primary membership of the party. The decision to this effect was taken during a meeting held here today. The Punjab Government Pensioners Association, Ferozepur, spokesperson Om Parkash Sharma and the Punjab Subordinate Services Federation, state unit senior vice-president Ravinder Luthra jointly presided over the meeting. Office-bearers of more than a dozen employee organisations, including ITI Employees Union state general secretary Harish Kamboj, Punjab State Pharmacists Association, Ferozepur president Shashi Kant, All India State Government Employees Federation national executive member Harbhajan Singh Khunger, former president Punjab Government Pensioners Association and patron Shiksha Sudhar Committee Raj Kishore Kalra, All Employees Coordination Committee president Vinod Nagpal, Women Employee Coordination Committee, Ferozepur president Kanwaljit Kaur and Health Employees Class-IV Union president Jagdish and others attended the meeting. The speakers highlighted that due to the lack of logical interpretation of recommendations of third pay commission in 1988, the Punjab government pensioners and employees working in the three border districts of Ferozepur, Amritsar and Gurdaspur were denied the rent allowance by the Punjab government. Om Parkash Sharma said that more than one lakh pensioners were likely to benefit from the decision. He lamented that the government had failed to implement the Supreme Court directive in letter and spirit even as the struggle continued for over 18 years. He said that hundreds of pensioners have in due course passed away without getting the benefits of protected house rent allowance. Ravinder Luthra urged the government to implement the decision in a fix time-frame. While submitting a memorandum supported by pictures, the deputation said that the chief engineer of the Drainage Department, Punjab, had deposited Rs 36,67,408 with the railway authorities on June 25, 2005 for redesigning the siphon to facilitate smooth flow of water in the Sarawan Bodla drain but the work is yet to start. Hussan Lal, superintending engineer of the department, says he personally visited the office of the divisional railway manager (DRM) at Ambala on August 23, 2007 to apprise the officials of the gravity of the situation. He was reportedly assured that the construction would be started within 15 days but nothing has so far been done. Regretting that the railway officials had ignored demy official (DO) letters sent by the sub-divisional magistrates of Abohar and Malout, the deputy director of the Horticulture Department and director of the Regional Station of the Punjab Agriculture University, the deputation alleged that the delay on the part of the works section of the Railways was aggravating the problem of water logging in over two dozen villages. Sikka told the GM that the Balluana MLA Gurtej Singh Ghuriana had also sent a letter to the DRM Harjeet Kumar Jaggi to express shock and dismay over the apathy of the railways. While finding no valid reason in delaying the redesigning of the siphon (culvert number 91), the legislator had said that flow of water in the drain from north to south side gets blocked since the floor bed of the culvert was 6 feet above the drain level. The overflowing water from the drain had accumulated in more than thousand acres of agricultural land falling within villages Pakki Tibbi, Balluana, Kera Khera, Bahawalbasi etc. Farmers have been ruined during last five-six years and some of them committed suicide also. Meanwhile, former MP Virendra Kataria informed this correspondent that he too had met the GM in his office recently and discussed the same problem. He had told Sahai that the drain posed threat to the Abohar-Bathinda rail track also near the culvert. The farmers are loosing the orchards which they had developed during last five years bearing heavy cost, Kataria added. The deputation who met the GM here said the farmers would be constrained to file a criminal petition in the appropriate court if work on the siphon is not started within a month. DRM Harjeet Kumar Jaggi was also present during the meeting. Sahai assured to take up the matter with the engineers on a priority basis. Sources in the EGS Teachers Union stated that the members of the union tried committing suicide after they were lathicharged and manhandled by the police. “We were moving towards the Gol Diggi to burn an effigy of the Badal government and the police asked us to burn it at the old bus stand. 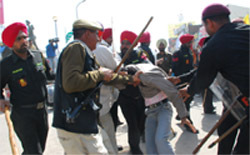 When we did not agree, the police resorted to lathicharge. Four members got injured and had to be hospitalised. 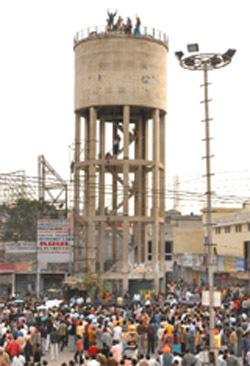 Frustrated with the attitude of the police, the members started climbing the tank at Gol Diggi to commit suicide,” said Kulwant Kumari, district president of EGS Teachers’ Union. Activists of student organisations like the ABVP and the Punjab Students Union (Shaheed Randhawa) reached the spot where the high-voltage drama was on and extended their support to the teachers. The activists of EGS Teachers’ Union, rural doctors, ETT Teachers’ Union and others also blocked the roads in the city today, which disrupted the flow of traffic. Kulwant Kumari stated that the EGS teachers climbed down from the water tank after a fax from the Punjab government, which stated that the EGS teachers had been admitted to the D.Ed course to commence in June this year. The fax bore the signatures of the SSP and DC. The second-level of the Olympiads was held after the top 500 students from each class had been selected from the level-1 tests held in the respective schools. The schools, from which more than 20 students appeared in the tests, included the Dasmesh Public School and the Baba Farid Public School, both of Faridkot. The Science Olympiad Foundation, area co-ordinator, G.S. Brar, said the result of the tests would appear on the Internet within 45 days. The prizes and gifts would be given to the toppers at a function in Delhi in May this year. Principal of the KV-I, T.D. Garg, said that the test was held on the school premises and school teachers were the invigilators. Toppers in different competitions for girl students, included Divya (solo dance), Anamika (fancy dress) and Harmanjot Kaur group (skit). In the boys' category, Lal Chand stood first in the solo dance, Akash Doda in folk singing and Harshdeep Singh in fancy dress competition. Kewal Krishan Makkar, a member of the board of directors of the school gave away the prizes. The chief guest Mohanbir Singh, additional director of Technical Education Department, was the chief guest. He was joined by the chairman Sanjeev Kumar Midha and principal Iqbal Singh Romana in lighting the lamp to inaugurate the gala function. Gidha performed by the traditionally dressed students enthralled the audience besides choreography, folk songs and other items. Talking to media at village Makha today, he said that this was a simple issue because the chairmen of election campaign committees were not included in the screening panels. He said that today's lathicharge in Bathinda on EGS teachers, particularly on women, was an example of atrocities. He further said that on the one hand, a woman representative of Badal family, Harsimrat Kaur, was assuring the people that rights of women would be protected, but on the other, women teachers fighting for their rights were being beaten up by cops. On the second day of the UGC sponsored national seminar on “Special education: A wake-up call" at the DAV College of Education here on Saturday evening, Jakhar exhorted the experts to draw a mechanism to identify the persons who were suffering from dyslexia, Down syndrome or autism besides updating system of education for the visually impaired kids. It may be mentioned here that Sandhu, a resident of village Kharunj, had joined SAD along with a large number of his supporters during the Punjab Assembly polls at the insistence of Sukhbir Badal. During the elections, Sandhu had supported Sher Singh Ghubaya, then SAD candidate and now MLA Jalalabad. Interestingly, Sher Singh has been declared the SAD candidate from Ferozepur parliamentary constituency. Sandhu in his resignation letter has alleged that he along with his supporters felt suffocated and harassed in SAD during the last two years.